Be in with the chance to green up your site with a year’s worth of free carbon-neutral hosting courtesy of the Leap Studio. It’s the start of a new month, and the beginning of our new monthly social campaign. Each month we will be sharing with you – our change-making friends and followers – juicy facts & stats around a dedicated topic, scorching hot graphics fresh from the studio, viral video snippets and oodles more goodies for you to enjoy. If you haven’t guessed already, this month our topic of choice is the power of eco-hosting. Did you know that if the internet was a country… it would be the 6th largest country in the world. Crazy right?! Who would of thought that since the first live website went live in 1991, there would now be over 1.5 billion websites available to the us today with the number still growing. But did you know that every time we search the web, considerable amounts of CO2 are being produced. In fact the internet produces 830 million tons of carbon dioxide every year – around 2% of global CO2 emissions. In sight of this, to kick start our new campaign, we are launching a brand spanking new eco-competition giving our social followers the chance to win a year’s free planet saving carbon-neutral hosting* [up to 5GB] perfect for businesses, bloggers and website owners. By choosing green hosting, you will be cutting down your carbon emissions, reducing your digital carbon-footprint and lowering your websites impact on the planet. With our eco-hosting service, unlike some providers, the data centres Wunderism (our hosting platform) are based in the UK and reach a PAS 2060 rating (specification for the demonstration of carbon neutrality). Plus, our offices run on 100% renewable energy supplied via our green energy supplier that uses solar, wind, hydro and biogen to create its renewable energy. We also offset any carbon emissions we create via the Cool Earth initiative. Eco Web Hosting by Leap from LEAP on Vimeo. All entry requirements must be completed in order for your entry to count. Competition closes 31.08.2018 at 12:00PM. If you haven’t already, take a peak at our blog post explaining everything you need to know about carbon-neutral hosting and how you can reduce your digital carbon footprint. The promoter is Leap Media Ltd, whose registered office is at 87 Alexandra Road, St Austell, Cornwall, PL25 4QW. The competition is open to residents of the United Kingdom aged 18 years or over except employees of Leap and their close relatives and anyone otherwise connected with the organisation or judging of the competition. Closing date for entry will be 31st August 2018 [12:00PM]. After this date the no further entries to the competition will be permitted. The rules of the competition and how to enter are as follows: Retweet competition tweet, comment and tag 3 change-making buddies, follow @Leapness. Entrants that do not follow all entry rules will be void from the competition and their entry will not count. Entrants will be required to have a registered Twitter account to enter the competition. 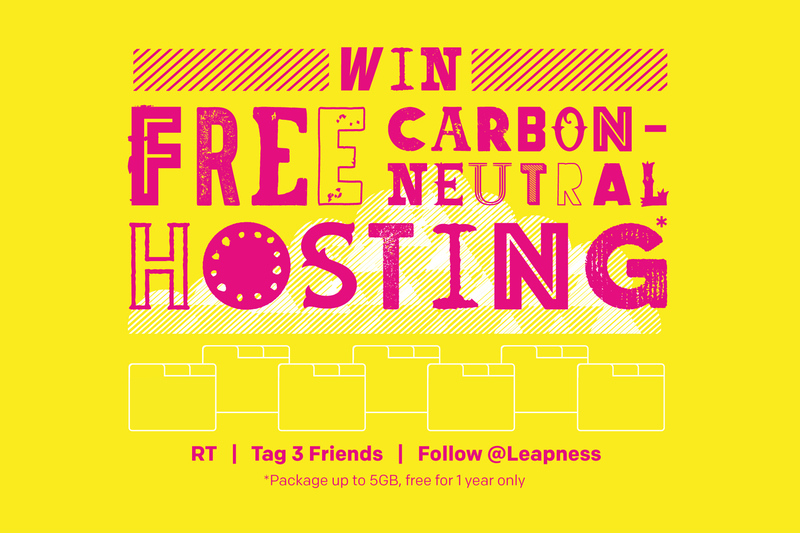 The prize is as follows: One year free carbon-neutral hosting package [up to 5GB website size] courtesy of Leap’s hosting provider Wunderism. If however the winning entrant’s website exceeds 5GB, Leap can offer an alternative hosting package, excluding the costs of the winning prize [value of £540]. The winner will be notified by DM on Twitter within 28 days of the closing date. If the winner cannot be contacted or does not claim the prize within 14 days of notification, we reserve the right to withdraw the prize from the winner and pick a replacement winner.